The UK meat industry has clubbed together £2 million to spend promoting red meat to young consumers in a bit to win back people reducing their meat consumption. The Meat Advisory Panel (MAP), a group of doctors, surgeons and nutritionists, will be central to the campaign. These ‘experts’ reject the well-known and established links between meat and cancer – the meat-risk deniers! 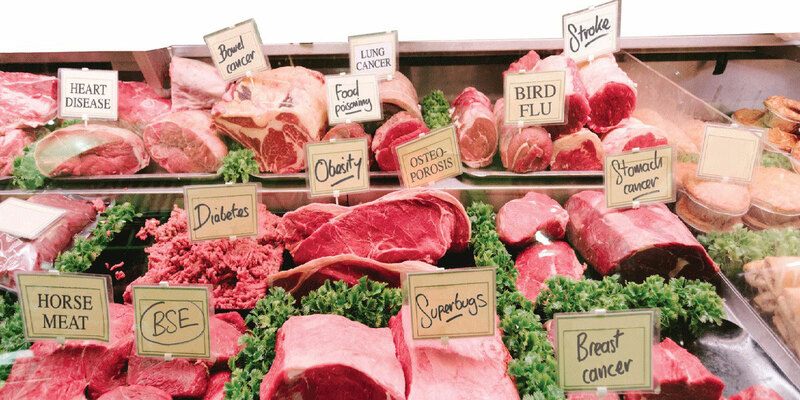 MAP members Professor Robert Pickard of Cardiff University, says: “Red and processed meats do not give you cancer”, and Mr Roger Leicester, consultant surgeon says: “There is no known evidence to suggest that red meat, by itself, causes cancer”. Another panel member, freelance dietician and media pundit Dr Carrie Ruxton says: “There’s no evidence that fresh red meat is a direct cause of cancer”. As well as casting doubt on the links between meat and cancer, Ruxton questions the well-known links between sugar and obesity. Ruxton, who sits on the board of Scottish public health body Food Standards Scotland, faced criticism last year after admitting receiving money from chocolate manufacturer Ferrero. Professor Simon Capewell, from the University of Liverpool’s Department of Public Health and Policy, said this raised questions about a conflict of interests and that the public has every right to be concerned. In a review of studies (funded by her previous employer, the Sugar Bureau) Ruxton said: “Results from high quality obesity studies did not suggest a positive association between body mass index and sugar intake”. Writing in the British Medical Journal, Capewell asked if we should welcome the food industry funding public health research. Studies funded by industry are up to 88 times more likely to favour the product that perticular industry produces – it makes sense – when did a meat industry funded study ever find that meat was harmful? Expect to hear more from Ruxton et al. about how great red meat is, but remember to take it with a large pinch of low-salt! To find out more about this story see Ruxton, you are spoiling us with your advice!. To find out more about the detrimental health effects of red, white and processed meat read our fully-referenced report Meat the Truth. To read more about the huge health benefits of a vegan diet see The Incredible Vegan Health Report.